The diameter of an undirected graph is the largest distance between any two nodes in the graph. Given an unrooted tree, is it possible to decrease the diameter by adding exactly one edge? Handle the special case N = 2 (the answer is “NO”). In the following, assume N > 2. First, find the centers of the tree (in O(N) time). There can be one or two centers. 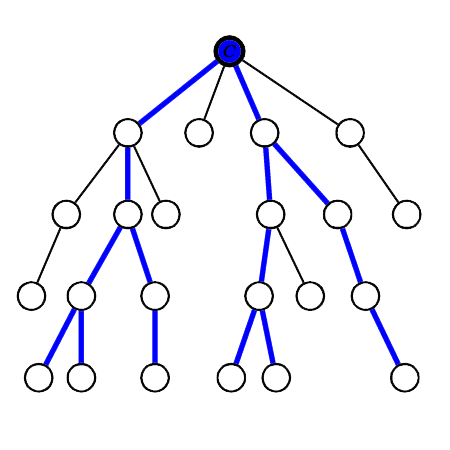 If there is only one center, root the tree at the center, and compute the height of each subtree. Let H be the height of the tree. Print “YES” if the root has exactly two children with height H-1, otherwise print “NO”. If there are two centers, remove the edge connecting the centers to form two trees, root the two trees on the centers, and compute the heights of all subtrees. Let H be the (common) height of both trees. Print “YES” if one of the roots has exactly one children with height H-1, otherwise print “NO”. Let us first define a few simple terms related to trees and graphs. The eccentricity of a node is the largest distance from that node to any other node in the graph. The diameter of an undirected graph has been defined already. It is the largest distance between any two nodes in the graph. Alternatively, it is the largest eccentricity of any node in the graph. We also call any longest path in the graph a diameter, so the term “diameter” can mean either a path or a number, and it will be clear in context which kind of “diameter” we are referring to. The radius of an undirected graph is the smallest eccentricity of any node in the graph. A center of an undirected graph is any node whose eccentricity is equal to the radius. Note that a graph can have many centers (in particular, in a complete graph, all nodes are centers). If R is the radius and D is the diameter, then R = \lceil D/2 \rceil (i.e. the radius is approximately half the diameter). A tree has either one or two centers. If there are two centers, then they are connected by an edge. All diameters pass through the center(s). The diameter is even if and only if there is one center. These are pretty standard facts and are easy to prove, so we leave this exercise to the reader. The following illustrates the two cases, depending on the number of centers. The blue-filled nodes are the centers, and the blue edges are part of some diameter. All in all, the facts above say that the circumstances are really nice for an unrooted tree. Let’s see how the center, radius and diameter can help us in answering the question. Note that all diameters pass through the center(s), which means that we only have to care about decreasing the lengths of those paths. We handle two cases, depending on whether there are one or two centers. Suppose there are exactly two direct subtrees of C with height R-1, say A_1 and A_2. In this case, all diameters pass through the sequence of nodes A_1-C-A_2 (or the reverse), and we can decrease the lengths of all these paths by adding an edge from A_1 to A_2, as shown below. The paths passing through A_1-C-A_2 can instead take a shortcut by passing directly through the new edge, bypassing C. So we conclude that the answer is “YES” if C has exactly two children with height R-1. What if there are more than two direct subtrees whose height is R-1? Then in this case, we can show that it is impossible to add one edge to decrease the lengths of all diameters. This is because each diameter passes through exactly two of these subtrees, but by adding an edge, we only influence paths that pass through two subtrees, so diameters passing through the remaining trees are not affected. This is illustrated in the following image, where there are three such children, A_1, A_2, A_3. In all the following cases, try to figure out why there are diameters which are not affected by adding the dashed edge. We now turn to the case where there are two centers, say C_1 and C_2. In this case, there is an edge between C_1 and C_2. Let’s ignore that edge first, and root the two resulting trees on C_1 and C_2. Now, we’re sure that C_1 and C_2 has at least one child each, unless the N is exactly two. But if there are just two nodes, we can simply output “NO” (there is only one such case. In fact, this case is given as a sample input). Therefore, we can assume that C_1 and C_2 has at least one child each. We can also show that the heights of both trees are equal. Let H be this common height (note that it is possible to show that H = R-1). All diameters pass through the node-sequence A-C_1-C_2, but by adding the new edge, the diameters can bypass the node C_1. Therefore, if C_1 has exactly one child of height H-1, then the answer is “YES”. A symmetric argument applies if C_2 has exactly one child of height H-1. No matter where we place the edge, there are still diameters that are not affected by the new edge. Therefore, the answer is “NO”. We have handled all the possible cases, and our solution runs in O(N) time (assuming we already know the centers of the tree). This is an optimal solution! Select an arbitrary node X. Find the farthest node Y from X. If there is more than one, pick any. Find the farthest node Z from Y. If there is more than one, pick any. The path Y-Z is now a diameter, so the centers are the centermost nodes on the path from Y to Z (there can be one or two such nodes). For any node, any farthest node from it is an endpoint of some diameter. Let D(i,j) be the distance between nodes i and j. The path X-Y doesn’t intersect any diameter. The path X-Y intersects some diameter. Case 1: The path X-Y doesn’t intersect any diameter. We will show that the path B-Y is longer than the diameter, which is a contradiction (because the diameter is the longest path). which shows that B-Y is indeed longer than the diameter A-B. This is a contradiction, therefore this case is impossible. Case 2: The path X-Y intersects some diameter. We will now show that the path B-Y is also a diameter, which shows that Y is an endpoint of some diameter. On the other hand, D(B,Y) \le D(B,A) because B-A is a diameter. Therefore, D(B,Y) = D(B,A), and B-Y is also a diameter, and we have shown that Y is an endpoint of some diameter. DFS from vertex “1” and find any one vertex at max depth (say v1). v1 is now one end of any one diameter-path of the tree. DFS from v1 and find any one vertex at max depth (say v2). This also finds the diameter D.
DFS from v1 and find all paths of length D. Let there be p1 such paths. DFS from v2 and find all paths of length D. Let there be p2 such paths. Count the number of vertices which occur in all (p1+p2) paths (there must be at least one, because if we have 2 disjoint D-length paths then there must be another path of length at least D+1). If count > 2 print yes else print no. If there are 3 or more such vertices they must form a path subgraph, which can be bypassed with the single edge. Although this is O(n**2) worst case, and shows pretty terrible understanding of the subtree method in the editorial, I took the risk in favour of typing speed and got AC in fastest time by far (0.26) typing in around 10 minutes. ‘Page not found’ on clicking at tester and setter’s solution. why solution of setters and testers are not opening ? Amazing Editorial! Really helpful thanks!